In Spain, oxtail stew recipes developed in areas where beef and leather were produced (oxtails being an inexpensive by-product of the industry). Oxtails are bony but have some meat and fat that contribute to the flavor of the dish. Spanish recipes for such dishes call for Spanish paprika and sometimes chili sauce, which give it a smoky, spicy taste. Oxtails benefit from long, slow cooking with savory ingredients. Braise the oxtails in a large pot on the stove top or in a roasting pan in the oven. Preheat your oven to 350-degrees Fahrenheit. Rinse the oxtails and pat them dry with paper towels. Sprinkle them with salt and pepper. Heat oil in your frying pan over moderately high heat until it is hot but not smoking. Brown the oxtails on all sides without crowding them. Transfer each batch of browned oxtails to a roasting pan. Spread the oxtails out in a single layer. Pour off all but 1 tbsp. of fat from the frying pan. Cook the onion, carrots, garlic and bay leaf in the frying pan over medium heat. Stir often, until the onion softens, which takes about six to seven minutes. Add the paprika and stir the ingredients for a minute over medium heat. Add the wine and bring the mixture to a boil, stirring to scrape up any browned vegetables on the bottom. Pour the onion mixture, canned tomatoes and tomato puree over the oxtails in the roasting pan. The liquid should come halfway up the sides of the oxtails. If the liquid doesn't come halfway up the sides of the oxtails, add a little water. Cover the roasting pan with a lid and cook the oxtails in the oven until they are tender, which takes three to three-and-a-half hours. Stir the mixture occasionally to prevent burning. 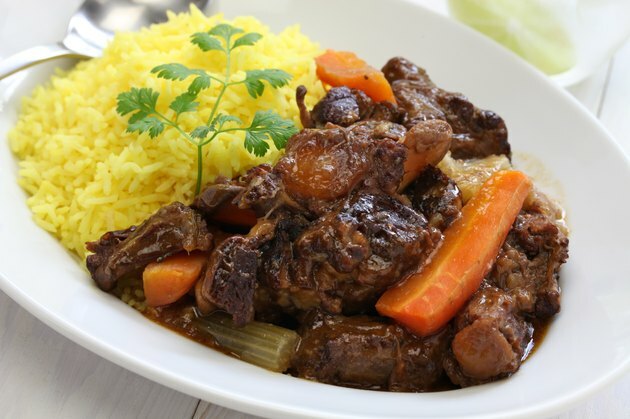 Remove the oxtails to a serving dish. Add the vinegar to the liquid in the roasting pan. Taste for seasoning and add salt and pepper, if necessary. Bring the roasting pan liquid to a boil, strain it and pour it over the oxtails. Garnish with parsley and cilantro. Add other aromatic vegetables if you like, such as bell peppers or chilis. Some recipes call for potatoes, which will become tender during the braising, almost disappearing.